Teeth whitening is one of the most popular cosmetic dental procedures demanded not only by those with discoloured theeth but also by patients who want to have brighter teeth, which can improve their looks. The causes of dicolouration can be genetic disease, taking tetracycline during pregnancy, fluorosis, trauma, aging, dental materials for tooth restauration, teeth exposure to matal salts to name but a few. The most common whiteners are hydrogen peroxide and carbamide peroxide. It is important to make a patient aware that prosthesis and composite fillings will not get brighter so that they will need to be replaced after the whitening procedure. With in-office whitening, we apply the gel containing 30% or 35%-38% of hydrogen peroxide or 35% of cardamide peroxide. 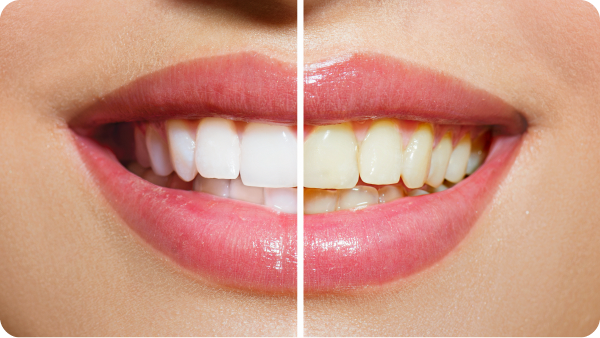 As it is very poweful bleaching it can be performed only under the careful supervison of a dentist. The gel is placed on a tooth surface and can be activated in the following ways: by a chemical reaction, heat, quartz-tungsten halogen lamp, plasma lamp, helio lamp or led laser. 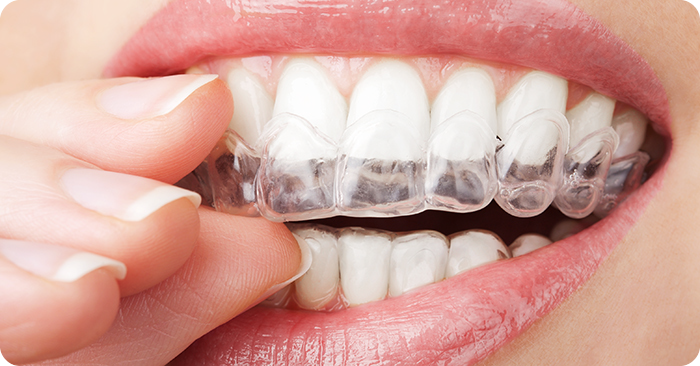 If the teeth are equally shaded the gel is applied onto the whole surface by a syrange. 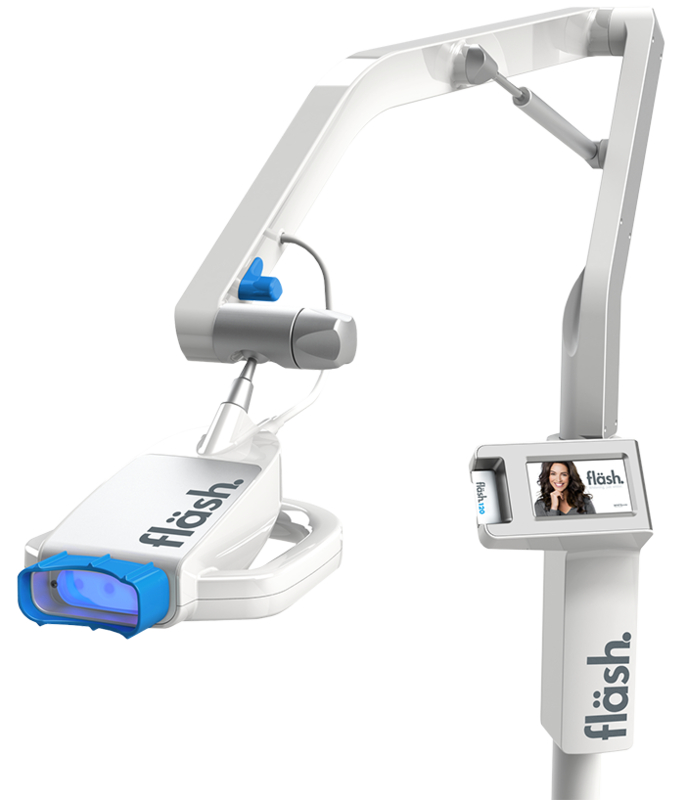 Gel application time varies and can be in several intervals of 15 to 20-minutes in one session, or a few 60-minute treatments repeated within a couple of days. Teeth bleaching during the night, also called Dentist-supervised patient-applied tehnique or Nightguard vital bleaching is proved to be very popular and effective. A patient uses a custom-made vinil tray which is filled with bleaching gel and wears it for about eigh hours overnight. The treament can last from a couple of days up to six weeks, depending on what effect we want to achieve. However, tetracyclin stainings require a treatment of 6 to 12 months. Bleaching gel is based on cabamid peroxide in conentration of 10 – 20%. If a patient decides to wear the tray during the day, they have to restrain from eating, drinking and smoking. If a patient notices a light sensitivity of teeth we recommened that they gradually increase the time of waering the tray. Another possibility is to alternately wear a trey with a peroxide gel and a tray with a fluor gel every other night which will have a calming effect on teeth and gums. The progress is reviewed the very next day and the following check-ups are avery 7 days. The treatment is finished when we decide that in two chek-ups in a row we have achieved the same brightness. Replacement of composite filling is done two weeks after the bleaching treatment. Bleaching of depulped teeth is done with high concentrated hydregon peroxide or carbamid peroxide. This techinique is also called the internal bleaching as the agent fills the pulp chamber. Before the treatment it is necessary to check the quality of the canal filling, which has to be homogenous and compact. If necessary, the endodonic therapy is repeated. 1 to 2 mm of canal filling is removed followed by the placement of glass ionomer cement or composit. The pulp chamber is to be thoroughly cleaned in order to estimate the level of colouring. The application of bleaching agents of high concentration (03 -38% of hydregon peroxide and 35 -100% of carbamid peroxide) provides satisfactory esthetic results as this type of discoloration is very noticeable and very difficult to treat with lower concentrations. In-office conditions allow us to use high concentrations treatment supervised by the dentist with the safety on the highest level.